We Create Great Views Inside and Out! Call for your Complementary In-home Consultation Today! Welcome to Classic Shutters and Blinds your local provider for interior Plantation Shutters, Window Blinds and Shades. Classic Shutters and Blinds serves communities in Raleigh, Cary, Apex, Holly Springs, Fuquay-Varina, Morrisville, Garner, Clayton, Wake Forest and many other communities within Wake County. We also have customers in Durham, Orange, Johnston and Lee Counties. Classic Shutters and Blinds can transform your home with high quality custom blinds, Plantation Shutters and shades for the precise degree of light control and that will add beauty and warmth to your home. We make shopping for window treatments simple by bringing our showroom to your door! Owner, Jason Williams will come to your home or business, with our vast selections of samples and window treatment options; take accurate measurements; provide a no obligation estimate and have your custom window treatments professionally installed. Classic Shutters and Blinds is locally owned and operated and has proudly served the Triangle since 2003. We are are a full service company from consultation to installation. Classic Shutters and Blinds also specializes in commercial and investment/rental properties as well. We offer a lovely faux wood blind which has all the benefits of a custom blind yet the cost is less than some of the big box home improvement stores. Call or Email us TODAY to schedule your Complementary In-Home Consultation! Classic Shutters and Blinds offers a beautiful line of interior plantation custom wood, faux wood and hybrid interior shutters at competitive prices. With a wide variety of styles, paints and stained finishes from several vendors for your selection. We take the hassle and worry out of buying custom interior shutters and add a unique and unmatched value to your home. Classic Blinds and Shutters offers both wood and faux wood blinds for your home and they will bring both warmth and beauty to your new or your existing home. It is hard for even the experts to distinguish between the faux and the real wood products. 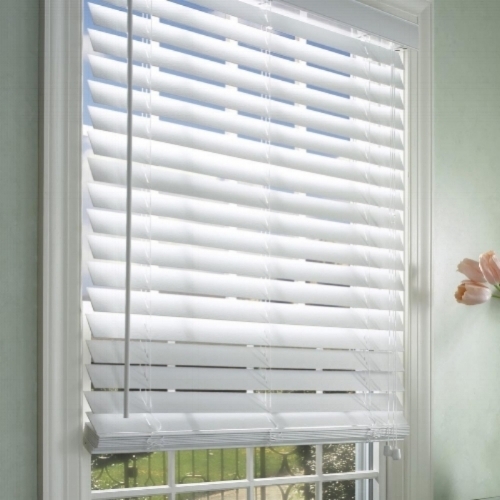 Our blinds are precision cut from the finest materials available and come with a limited lifetime warranty. Shades combine the beauty of a fabric treatment with the easy operation of a shade. Choose from a flat fold for a smooth, neat look or a looped for soft, cascading folds. The soft folds of fabric are available in numerous patterns, textures, and colors. Room darkening liners can be added to fully block out light. Consider the top down/bottom up option which allows the shade to be opened from the top, bottom, or both for a winning combination of both privacy and light control.